Have you heard that making this Instant Pot detox and weight loss cabbage soup can help you shed some unwanted pounds? I use this soup to replace one meal per day, to help me work towards shedding some unwanted weight. 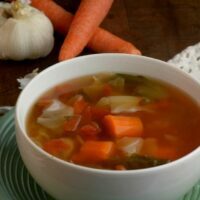 This Detox and weight loss cabbage soup is so simple to make, loaded with veggies, in a tasty broth. Now, before we dive in, this soup is not meant to be eaten for every meal of the day. Back when this soup first really become popular, people were only eating this soup all day long. Such an unhealthy idea. If you use it to replace a meal like supper or lunch, you are gaining the benefits of detoxing your body in a healthy way. I also drink my immune boosting smoothie and a fat burning smoothie. Both of these are a great way to kickstart the day or a pick-me-up at lunchtime. Veggie loaded, vibrant and bold flavors, simmered in a savory broth. The Instant Pot handles all the work of blending and breaking down the veggies and cabbage. If you have a Ninja Foodi you could even make it in that. Since the Foodi offers an electric pressure cooker setting, you get the same exact outcome. You will find that cabbage is wonderful for detoxifying your body. Cabbage offers diuretic properties which will help flush out toxins. Also, cabbage is sulfur-rich which means it is going to help your liver begin to break down any toxins in your body and help them pass through. You are eating a really low-calorie meal, and it will help you burn off calories and drop some weight. If you adapt the rest of your meals by reaching for more vegetables and lean protein, and passing on the sugar and starches you can truly shed weight faster. Make sure to replace those sugary drinks with water as well. Will this soup promise to make you lose five or ten pounds, no. 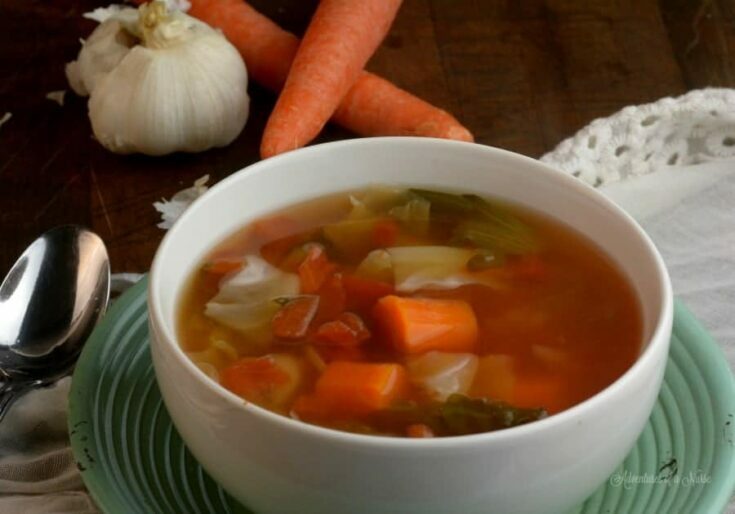 But it is a healthy soup that is full of veggies and awesome ingredients that can help relieve bloat, cleanse your body, and leave you feeling energized for the day. As you can see, this recipe is so simple to make. Even if you don’t want it for weight loss it makes for a really delicious and filling weeknight meal. 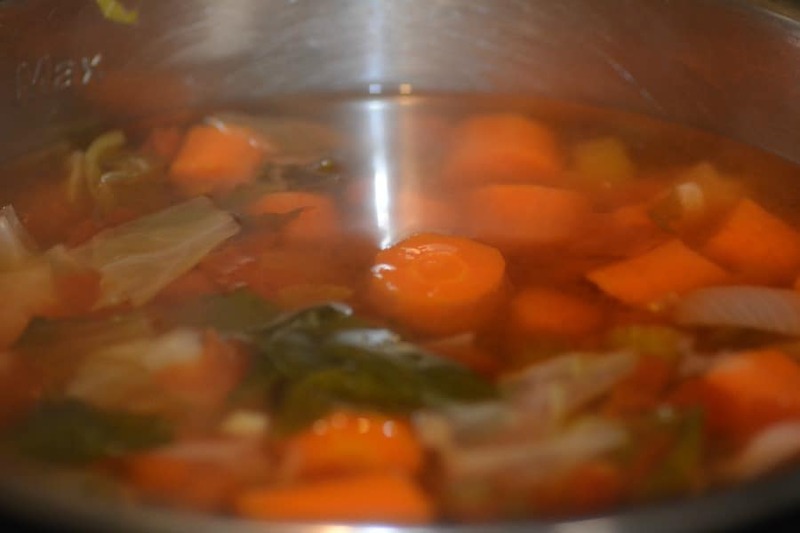 I love a good cabbage soup recipe, and this is my go-to recipe each and every time. Place all ingredients in the Instant Pot. Do a quick release. Enjoy! DELICIOUS! Added some lean ground meat to mine! Thank you for sharing! I have prepared the soup tonight! I added some chicken strip. Since I don’t like soup I made it a purée. Love it! Thank you for sharing! How many servings does the recipe make? Can you tell me what makes the carb count so high in this recipe? Thank you!? What are the calories and carb count ect. On this meal I can’t find the info?? Carrots have a naturally high amount of carbs. what time ratio would I use for a crockpot? This has amazing flavor!!!! Thank you for a quick healthy recipe! I made this and it was incredible. I got 7 portions out of it. Just how I remember my mother’s tasting! Just made this for lunch. It was very good. I had to make it stovetop because I only have a. 3 qt mini instant pot. I added just a few bites of smoked turkey sausage to appease my husband. Next time I’ll cut back just a little on the lemon juice and vinegar. It was really yummy and I have leftovers. Browned some lean ground chicken with garlic before hand. Substituted one of the cans of broth for one can of condensed tomato soup w/ a cup of water.